A species is a group of organisms that share a genetic heritage, are able to interbreed, and to create offspring that are also fertile. Different species are separated from each other by reproductive barriers. These barriers can be geographical, such as a mountain range separating two populations, or genetic barriers that do not allow for reproduction between the two populations. Scientists have changed their definition of a species several times throughout history. Species is one of the most specific classification that scientists use to describe animals. Scientists use a system of binomial nomenclature to describe animals without the confusion of common names. This system uses the genus as the first name, which is always capitalized, and the species name is the second name, always lower case. Thus, some animals like the Red fox, Vulpes vulpes, are both in the genus Vulpes and their species name is vulpes. Note the capitalization difference to distinguish between genus and species. Other foxes such as the swift fox, Vulpes velox, are also part of the Vulpes genus, but barriers exist that keep them from interbreeding with the Red foxes. In this way, they remain distinct species. Since the days of Carl Linnaeus, the creator of binomial nomenclature, animals have been constantly classified and reclassified into different groups, genre, species and subspecies. Linnaeus, classifying organisms in the 1700s, restricted his classifications to the physical attributes of various organisms. Most organism, surprisingly, he correctly identified as being related. Others, however, he couldn’t have been more wrong about. Modern day genetic techniques have given us a much better window into the historical relationships between animals. For instance, when Linnaeus first classified the elephant in the early 1700s, he only ever saw one specimen. The specimen was a fetal Asian elephant, the smallest of the known elephants today. Not knowing better, Linnaeus named the species Elephas maximus. Modern day scientists have been forced to reclassify the elephant several times. The first distinction is between the Asian and African elephants, which are much different in size. Scientists then further had to distinguish between elephants that inhabited grasslands and those that lived in forests in Africa. Genetics show the populations do not interbreed and are separated by a reproductive barrier. In the next century, Charles Darwin and Alfred Wallace separately conceived of the mechanism that creates multiple species from a single species. This process of natural selection applies adversity of different forms that organisms must overcome to reproduce. Organisms that are better adapted to the environment are able to reproduce more, and their offspring can also increase in number. In this way, different lines of the same species can do better or worse, depending on their genetics. Eventually, two successful lines may diverge, creating a reproductive barrier between the two populations. These populations, according to Darwin and Wallace, are now considered separate species. Since the beginning of time, this process has been occurring and dividing organisms along different successful lineages. This theory has been confirmed by a large body of evidence. Fossil evidence provides clues that animals have been constantly changing over time, in response to a variable environment. Where Linnaeus saw animals as static, unchanging entities, it is now widely accepted that species exist on a spectrum, with some being closer related to certain species than others. Because of this, animals can often hybridize, or mate between species. Oftentimes the only barrier to reproduction is geographic, or based on the physical location of the animals. If this changes, the animals can interbreed, and may merge into one species. This is currently being seen in the wild in polar bears and grizzly bears. As the climate changes, polar bears are forced further south, and must start exploiting different food sources. The change in climate also allows grizzly bears to venture further north, encountering polar bears along the way. The previously separated populations now have a chance to breed, and sometimes they are successful. Hybrids have been seen in the wild, but it is not yet known if they hybrids will be successful. There are many different situations and examples of reproductive barriers, but if the barrier can be removed, it is likely that two related species will be able to interbreed. Non-related species rarely have a possibility of breeding because they have become too different from each other. For instance, a bat and turtle have a completely different genetic makeup. The genes that control growth in the turtle would not function in a bat, and vis-versa. In fact, they don’t even have the same number of chromosomes, which is a requirement for sexually reproducing organisms to be successful. Still other animals, like dogs and wolves, are still technically the same species. While they have the same number of chromosomes and could technically breed, the domestic dog has come a long way from its wild counterpart. Dogs have not only evolved to be more cuddly and soft, but are attuned to human social cues. Wolves operate in a much different social structure. As such, the two are very unlikely to breed in the real world. However, because they can create fertile offspring, scientists consider them the same species. 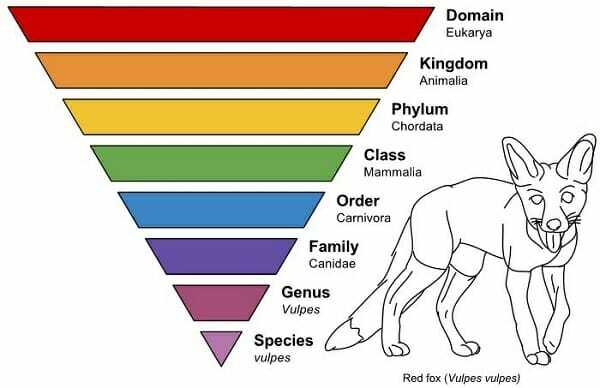 Dogs and wolves are a good example of species radiation, or the incremental changing in a population that is widely distributed. Think of a Chihuahua. If Linnaeus had classified this animal, he certainly would not have put it in the same category as a wolf. However, a Chihuahua can breed with a slightly bigger dog, which can breed with large dog, which could easily breed with a wolf. In this way, a Chihuahua and a wolf have the same genetic basis, expressed in very different ways. Hybrid – An organism produced by the crossing of two distinct species. Reproductive Barriers – Obstacles that prevent two animals from producing fertile offspring. Binomial Nomenclature – The system of naming individual species with two Latin names, the first related to their genus, the second to their species. Taxonomical Hierarchy – The system into which all organisms are placed for classification. 1. Domestic ferrets and wild black-footed ferrets look almost identical. The black-footed ferret, Mustela nigripes, is native to North America. The domestic ferret, Mustela putorius furo, is native to Europe and only exists in captivity in North America. Could these two populations be one species? C is correct. In all likelihood, the domestic ferret and black-footed ferrets have become so different, socially and otherwise, that interbreeding would not be possible. However, they are still in the same genus, Mustela, which suggest that their genetics could be compatible. If the reproductive barriers could be overcome, the two species could possibly interbreed. 2. If scientists tell species apart by how they look, why aren’t males and females that look differently considered different species? A is correct. The reason some species display sexual-dimorphism is that the pressures and males and females are different in nature. Females are often responsible for raising the brood, or carrying the offspring during pregnancy. The males are typically responsible for protecting the brood or female while she is pregnant. There are many cases where these roles are reversed. Either way, different forms require different functions, but the defining characteristic of a species is the ability to successfully interbreed. 3. It was recently discovered that what where believed to be two species of trout, one in Russia and one in the US, have almost identical DNA and can reproduce if the eggs and sperm are artificially brought together. The populations are continually separated by saltwater ocean, which they cannot traverse. While some scientists have argued to make them one species, others have argued to keep them separate. What is the argument for keeping them as separate species? A. They cannot successfully interbreed. B. They are still separated by a geographical reproductive barrier. C. There are no good arguments. B is correct. There is no way the trout could naturally reproduce, because they are separated by thousands of miles of sea-water. This reproductive barrier will remain unless the trout adapt a method of living in saltwater and traversing the ocean. While they can successfully breed when their eggs and sperm are brought together, it could not happen without human intervention. This is a good argument for why the trout should remain separate species.